Founded by Dr. Abhishek Pilani and Dr. Priyanka Desai Pilani, Assure clinic offers wide range of procedures for healthy hair, skin and body. After running five successful clinics in Mumbai, Surat and Raipur, Assure launched its sixth clinic in Bangalore on Sunday. The clinic is situated at 3049, 80 Feet Road, HAL 2nd Stage, Indiranagar, Bangalore. 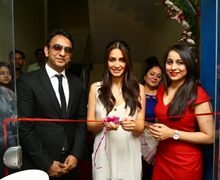 The launch was done by Bollywood actress Kriti Kharbanda. The founding principle of Assure Clinic is that each patient should be provided with the full individual attention and care of qualified medical professionals, to ensure that he or she can enjoy a lifetime of completely natural-looking hair. Dr Abhishek Pilani is one of the India’s leading hair replacement surgeons, with extensive experience. For Assure Clinic team he has hand-picked specialists. Each of whom he has personally trained or selected. This means that throughout the practice an exceptional standard of technical excellence is combined with Dr Pilani’s ethos of ongoing personal care for every single patient. Assure Clinic is renowned for pioneering the adoption of high quality FUE – Follicular Unit Extraction in India. The clinic has developed the FUE procedure extensively to provide high-quality, natural and dependable results for men and women. These procedures are performed by our Senior MD Dermatologists. Doctors at Assure Clinic implant and extract all the follicles to ensure the best results possible for each patient.